► User manuals for Little Navmap and Little Navconnect in all formats and languages. ► Support Forum at Avsim Support and help for users. ► Little Navmap - Install Navigraph Updates Shows how to update the included Navigraph database to the latest cycle. ► GitHub Profile All my projects, releases, source code, issue lists and more. ► About Translation Packages General information about translation packages. Donate to show your appreciation if you like my programs. Spenden Sie, um Ihre Wertschätzung zu zeigen, wenn Ihnen meine Programme gefallen. ► Little Navmap is a free open source flight planner, navigation tool, moving map, airport search and airport information system for Flight Simulator X, Prepar3D and X-Plane. A widely configurable map display using the OpenStreetMap as a background map which is only one option of many online and included offline maps. The map shows airports, navaids, airways, airspaces, AI or multiplayer aircraft and ships as well as airport weather. A seamlessly integrated airport diagram displays taxiways, displaced thresholds, overrun areas, aprons, parking spots and more. 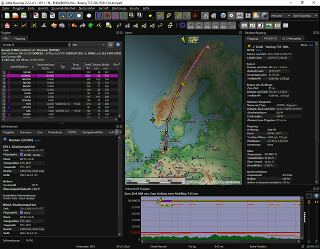 It supports approach and departure procedures like SIDs and STARs, offers several automatic flight plan calculation options and multiple export formats like GFP (Reality XP GTN and Flight1 GTN), FPL (Reality XP GNS), GPX, RTE, FLP and X-Plane FMS 3/11 as well as drag and drop flight plan editing on the map. The program can read the PLN, FMS and FLP flight plan formats. An elevation profile is shown for the flight plan allowing to find a safe cruise altitude also displaying top climb, top of descent and procedure altitude restrictions. Aircraft performance and fuel planning is included which is also used to calculate top of climb and top of descent. Search functionality allows to look for airports, navaids or procedures by a large amount of criteria also including a spatial search. The program can generate an ATS route description from flight plans and vice versa where the output is widely configurable. 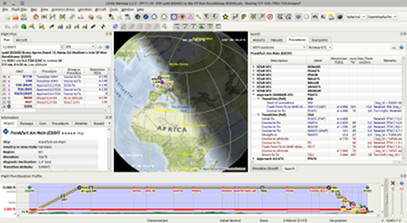 The nav database can be updated by the Navigraph FMS Data Manager. A cycle 1801 database is included. Complete edit, display, import and export functionality for user defined waypoints. 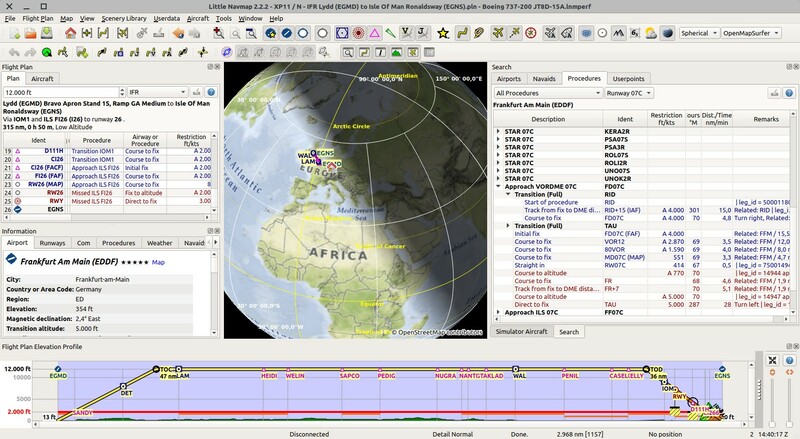 Import and export of CSV, X-Plane and Garmin files. 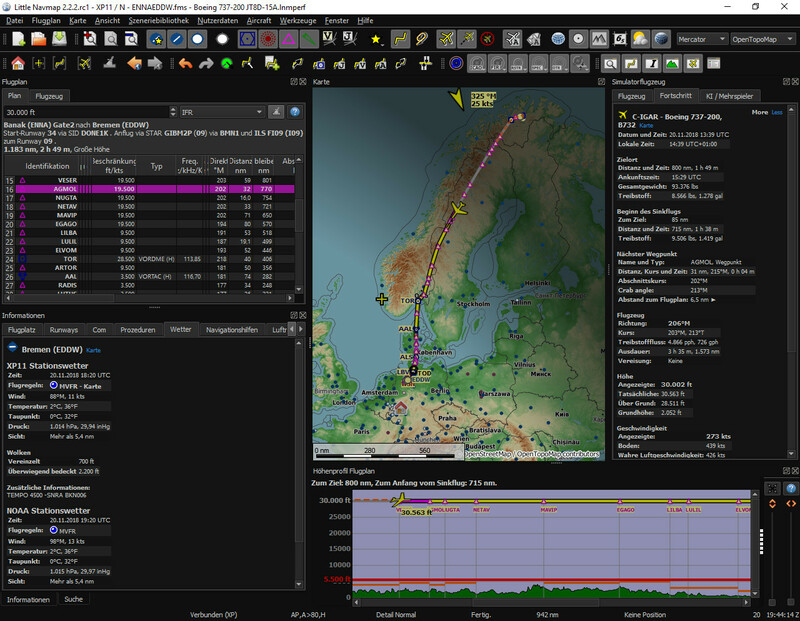 Display of clients and centers of VATSIM and custom online networks. Supported Flight Simulators: All FSX versions from SP2 up, Flight Simulator - Steam Edition, Prepar3D v2, v3, v4 and X-Plane 11. Supported platforms: Windows 7/8/10, macOS (10.10 or newer only) and Linux (64 bit only). ► Little Navconnect is a small free open source application that acts as an agent connecting Little Navmap with a flight simulator. This allows to use Little Navmap on Linux or macOS and saves the the pain of setting up remote SimConnect links for FSX or Prepar3D. Supported platforms: Windows 7/8/10, Apple macOS and Linux (64 bit). Little Xpconnect is a X-Plane plugin that allows Little Navmap and Little Navconnect to connect to X-Plane. It is light weight, free and open source. Little Xpconnect is included in the download archive of Little Navmap. Supported Flight Simulators: X-Plane 11 (64 bit). Supported platforms: Windows 7/8/10, Apple macOS and Linux. Last upddate on Mon, 11 Feb 2019 14:00:00 +0000.